Hillary Clinton loves black people. And black people love Hillary—or so it seems. Black politicians have lined up in droves to endorse her, eager to prove their loyalty to the Clintons in the hopes that their faithfulness will be remembered and rewarded. Black pastors are opening their church doors, and the Clintons are making themselves comfortably at home once again, engaging effortlessly in all the usual rituals associated with “courting the black vote,” a pursuit that typically begins and ends with Democratic politicians making black people feel liked and taken seriously. Doing something concrete to improve the conditions under which most black people live is generally not required. Hillary is looking to gain momentum on the campaign trail as the primaries move out of Iowa and New Hampshire and into states like South Carolina, where large pockets of black voters can be found. According to some polls, she leads Bernie Sanders by as much as 60 percent among African Americans. It seems that we—black people—are her winning card, one that Hillary is eager to play. And it seems we’re eager to get played. Again. The love affair between black folks and the Clintons has been going on for a long time. It began back in 1992, when Bill Clinton was running for president. He threw on some shades and played the saxophone on The Arsenio Hall Show. It seems silly in retrospect, but many of us fell for that. At a time when a popular slogan was “It’s a black thing, you wouldn’t understand,” Bill Clinton seemed to get us. When Toni Morrison dubbed him our first black president, we nodded our heads. We had our boy in the White House. Or at least we thought we did. Black voters have been remarkably loyal to the Clintons for more than 25 years. It’s true that we eventually lined up behind Barack Obama in 2008, but it’s a measure of the Clinton allure that Hillary led Obama among black voters until he started winning caucuses and primaries. Now Hillary is running again. This time she’s facing a democratic socialist who promises a political revolution that will bring universal healthcare, a living wage, an end to rampant Wall Street greed, and the dismantling of the vast prison state—many of the same goals that Martin Luther King Jr. championed at the end of his life. Even so, black folks are sticking with the Clinton brand. What have the Clintons done to earn such devotion? Did they take extreme political risks to defend the rights of African Americans? Did they courageously stand up to right-wing demagoguery about black communities? Did they help usher in a new era of hope and prosperity for neighborhoods devastated by deindustrialization, globalization, and the disappearance of work? When Bill Clinton ran for president in 1992, urban black communities across America were suffering from economic collapse. Hundreds of thousands of manufacturing jobs had vanished as factories moved overseas in search of cheaper labor, a new plantation. Globalization and deindustrialization affected workers of all colors but hit African Americans particularly hard. Unemployment rates among young black men had quadrupled as the rate of industrial employment plummeted. Crime rates spiked in inner-city communities that had been dependent on factory jobs, while hopelessness, despair, and crack addiction swept neighborhoods that had once been solidly working-class. Millions of black folks—many of whom had fled Jim Crow segregation in the South with the hope of obtaining decent work in Northern factories—were suddenly trapped in racially segregated, jobless ghettos. On the campaign trail, Bill Clinton made the economy his top priority and argued persuasively that conservatives were using race to divide the nation and divert attention from the failed economy. In practice, however, he capitulated entirely to the right-wing backlash against the civil-rights movement and embraced former president Ronald Reagan’s agenda on race, crime, welfare, and taxes—ultimately doing more harm to black communities than Reagan ever did. We should have seen it coming. Back then, Clinton was the standard-bearer for the New Democrats, a group that firmly believed the only way to win back the millions of white voters in the South who had defected to the Republican Party was to adopt the right-wing narrative that black communities ought to be disciplined with harsh punishment rather than coddled with welfare. Reagan had won the presidency by dog-whistling to poor and working-class whites with coded racial appeals: railing against “welfare queens” and criminal “predators” and condemning “big government.” Clinton aimed to win them back, vowing that he would never permit any Republican to be perceived as tougher on crime than he. As president, Bill Clinton mastered the art of sending mixed cultural messages. Clinton mastered the art of sending mixed cultural messages, appealing to African Americans by belting out “Lift Every Voice and Sing” in black churches, while at the same time signaling to poor and working-class whites that he was willing to be tougher on black communities than Republicans had been. 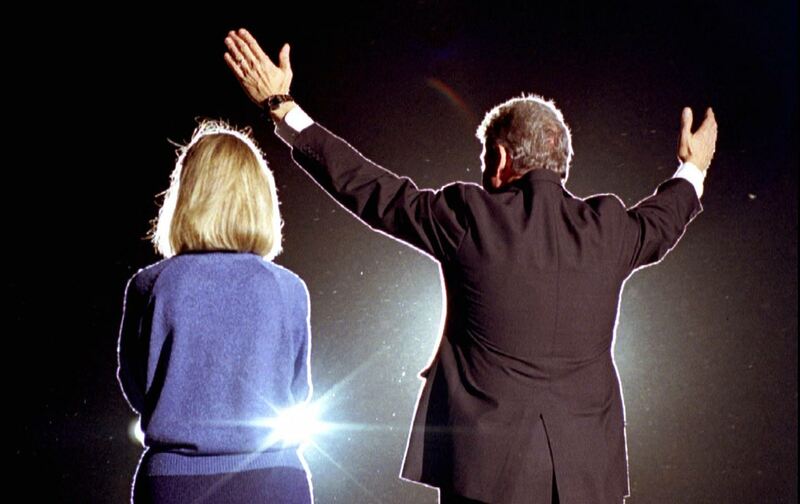 Clinton was praised for his no-nonsense, pragmatic approach to racial politics. He won the election and appointed a racially diverse cabinet that “looked like America.” He won re-election four years later, and the American economy rebounded. Democrats cheered. The Democratic Party had been saved. The Clintons won. Guess who lost? Bill Clinton presided over the largest increase in federal and state prison inmates of any president in American history. Clinton did not declare the War on Crime or the War on Drugs—those wars were declared before Reagan was elected and long before crack hit the streets—but he escalated it beyond what many conservatives had imagined possible. He supported the 100-to-1 sentencing disparity for crack versus powder cocaine, which produced staggering racial injustice in sentencing and boosted funding for drug-law enforcement. Both Clintons now express regret over the crime bill, and Hillary says she supports criminal-justice reforms to undo some of the damage that was done by her husband’s administration. But on the campaign trail, she continues to invoke the economy and country that Bill Clinton left behind as a legacy she would continue. So what exactly did the Clinton economy look like for black Americans? Taking a hard look at this recent past is about more than just a choice between two candidates. It’s about whether the Democratic Party can finally reckon with what its policies have done to African-American communities, and whether it can redeem itself and rightly earn the loyalty of black voters. An oft-repeated myth about the Clinton administration is that although it was overly tough on crime back in the 1990s, at least its policies were good for the economy and for black unemployment rates. The truth is more troubling. As unemployment rates sank to historically low levels for white Americans in the 1990s, the jobless rate among black men in their 20s who didn’t have a college degree rose to its highest level ever. This increase in joblessness was propelled by the skyrocketing incarceration rate. Why is this not common knowledge? Because government statistics like poverty and unemployment rates do not include incarcerated people. As Harvard sociologist Bruce Western explains: “Much of the optimism about declines in racial inequality and the power of the US model of economic growth is misplaced once we account for the invisible poor, behind the walls of America’s prisons and jails.” When Clinton left office in 2001, the true jobless rate for young, non-college-educated black men (including those behind bars) was 42 percent. This figure was never reported. Instead, the media claimed that unemployment rates for African Americans had fallen to record lows, neglecting to mention that this miracle was possible only because incarceration rates were now at record highs. Young black men weren’t looking for work at high rates during the Clinton era because they were now behind bars—out of sight, out of mind, and no longer counted in poverty and unemployment statistics. To make matters worse, the federal safety net for poor families was torn to shreds by the Clinton administration in its effort to “end welfare as we know it.” In his 1996 State of the Union address, given during his re-election campaign, Clinton declared that “the era of big government is over” and immediately sought to prove it by dismantling the federal welfare system known as Aid to Families With Dependent Children (AFDC). The welfare-reform legislation that he signed—which Hillary Clinton ardently supported then and characterized as a success as recently as 2008—replaced the federal safety net with a block grant to the states, imposed a five-year lifetime limit on welfare assistance, added work requirements, barred undocumented immigrants from licensed professions, and slashed overall public welfare funding by $54 billion (some was later restored). Experts and pundits disagree about the true impact of welfare reform, but one thing seems clear: Extreme poverty doubled to 1.5 million in the decade and a half after the law was passed. What is extreme poverty? US households are considered to be in extreme poverty if they are surviving on cash incomes of no more than $2 per person per day in any given month. We tend to think of extreme poverty existing in Third World countries, but here in the United States, shocking numbers of people are struggling to survive on less money per month than many families spend in one evening dining out. Currently, the United States, the richest nation on the planet, has one of the highest child-poverty rates in the developed world. Bill Clinton championed discriminatory laws against formerly incarcerated people that have kept millions of Americans locked in a cycle of poverty and desperation. The Clinton administration eliminated Pell grants for prisoners seeking higher education to prepare for their release, supported laws denying federal financial aid to students with drug convictions, and signed legislation imposing a lifetime ban on welfare and food stamps for anyone convicted of a felony drug offense—an exceptionally harsh provision given the racially biased drug war that was raging in inner cities. Perhaps most alarming, Clinton also made it easier for public-housing agencies to deny shelter to anyone with any sort of criminal history (even an arrest without conviction) and championed the “one strike and you’re out” initiative, which meant that families could be evicted from public housing because one member (or a guest) had committed even a minor offense. People released from prison with no money, no job, and nowhere to go could no longer return home to their loved ones living in federally assisted housing without placing the entire family at risk of eviction. Purging “the criminal element” from public housing played well on the evening news, but no provisions were made for people and families as they were forced out on the street. By the end of Clinton’s presidency, more than half of working-age African-American men in many large urban areas were saddled with criminal records and subject to legalized discrimination in employment, housing, access to education, and basic public benefits—relegated to a permanent second-class status eerily reminiscent of Jim Crow. It is difficult to overstate the damage that’s been done. Generations have been lost to the prison system; countless families have been torn apart or rendered homeless; and a school-to-prison pipeline has been born that shuttles young people from their decrepit, underfunded schools to brand-new high-tech prisons. It didn’t have to be like this. As a nation, we had a choice. Rather than spending billions of dollars constructing a vast new penal system, those billions could have been spent putting young people to work in inner-city communities and investing in their schools so they might have some hope of making the transition from an industrial to a service-based economy. Constructive interventions would have been good not only for African Americans trapped in ghettos, but for blue-collar workers of all colors. At the very least, Democrats could have fought to prevent the further destruction of black communities rather than ratcheting up the wars declared on them. Of course, it can be said that it’s unfair to criticize the Clintons for punishing black people so harshly, given that many black people were on board with the “get tough” movement too. It is absolutely true that black communities back then were in a state of crisis, and that many black activists and politicians were desperate to get violent offenders off the streets. What is often missed, however, is that most of those black activists and politicians weren’t asking only for toughness. They were also demanding investment in their schools, better housing, jobs programs for young people, economic-stimulus packages, drug treatment on demand, and better access to healthcare. In the end, they wound up with police and prisons. To say that this was what black people wanted is misleading at best. By 1996, the penal budget was twice the amount that had been allocated to food stamps. To be fair, the Clintons now feel bad about how their politics and policies have worked out for black people. Bill says that he “overshot the mark” with his crime policies; and Hillary has put forth a plan to ban racial profiling, eliminate the sentencing disparities between crack and cocaine, and abolish private prisons, among other measures. But what about a larger agenda that would not just reverse some of the policies adopted during the Clinton era, but would rebuild the communities decimated by them? If you listen closely here, you’ll notice that Hillary Clinton is still singing the same old tune in a slightly different key. She is arguing that we ought not be seduced by Bernie’s rhetoric because we must be “pragmatic,” “face political realities,” and not get tempted to believe that we can fight for economic justice and win. When politicians start telling you that it is “unrealistic” to support candidates who want to build a movement for greater equality, fair wages, universal healthcare, and an end to corporate control of our political system, it’s probably best to leave the room. This is not an endorsement for Bernie Sanders, who after all voted for the 1994 crime bill. I also tend to agree with Ta-Nehisi Coates that the way the Sanders campaign handled the question of reparations is one of many signs that Bernie doesn’t quite get what’s at stake in serious dialogues about racial justice. He was wrong to dismiss reparations as “divisive,” as though centuries of slavery, segregation, discrimination, ghettoization, and stigmatization aren’t worthy of any specific acknowledgement or remedy. But recognizing that Bernie, like Hillary, has blurred vision when it comes to race is not the same thing as saying their views are equally problematic. Sanders opposed the 1996 welfare-reform law. He also opposed bank deregulation and the Iraq War, both of which Hillary supported, and both of which have proved disastrous. In short, there is such a thing as a lesser evil, and Hillary is not it. The biggest problem with Bernie, in the end, is that he’s running as a Democrat—as a member of a political party that not only capitulated to right-wing demagoguery but is now owned and controlled by a relatively small number of millionaires and billionaires. Yes, Sanders has raised millions from small donors, but should he become president, he would also become part of what he has otherwise derided as “the establishment.” Even if Bernie’s racial-justice views evolve, I hold little hope that a political revolution will occur within the Democratic Party without a sustained outside movement forcing truly transformational change. I am inclined to believe that it would be easier to build a new party than to save the Democratic Party from itself. Of course, the idea of building a new political party terrifies most progressives, who understandably fear that it would open the door for a right-wing extremist to get elected. So we play the game of lesser evils. This game has gone on for decades. W.E.B. Du Bois, the eminent scholar and co-founder of the NAACP, shocked many when he refused to play along with this game in the 1956 election, defending his refusal to vote on the grounds that “there is but one evil party with two names, and it will be elected despite all I do or say.” While the true losers and winners of this game are highly predictable, the game of lesser evils makes for great entertainment and can now be viewed 24 hours a day on cable-news networks. Hillary believes that she can win this game in 2016 because this time she’s got us, the black vote, in her back pocket—her lucky card. She may be surprised to discover that the younger generation no longer wants to play her game. Or maybe not. Maybe we’ll all continue to play along and pretend that we don’t know how it will turn out in the end. Hopefully, one day, we’ll muster the courage to join together in a revolutionary movement with people of all colors who believe that basic human rights and economic, racial, and gender justice are not unreasonable, pie-in-the-sky goals. After decades of getting played, the sleeping giant just might wake up, stretch its limbs, and tell both parties: Game over. Move aside. It’s time to reshuffle this deck.